Story: Johnny Depp and Tim Burton join forces again in a big-screen adaptation of Stephen Sondheim's award-winning musical thriller "Sweeney Todd." 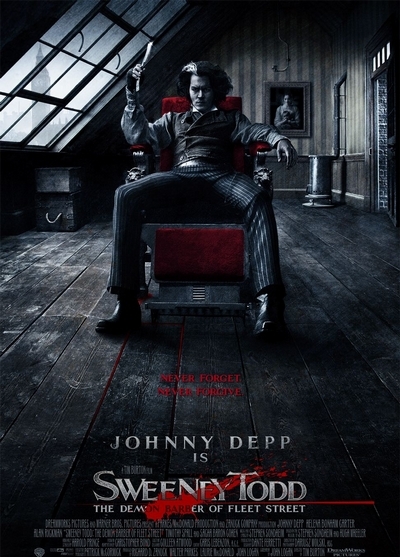 Depp stars in the title role as a man unjustly sent to prison who vows revenge, not only for that cruel punishment, but for the devastating consequences of what happened to his wife and daughter. When he returns to reopen his barber shop, Sweeney Todd becomes the Demon Barber of Fleet Street who "shaved the heads of gentlemen who never thereafter were heard from again." Joining Depp is Helena Bonham Carter as Mrs. Lovett, Sweeney's amorous accomplice, who creates diabolical meat pies. The cast also includes Alan Rickman, who portrays the evil Judge Turpin, who sends Sweeney to prison and Timothy Spall as the Judge's wicked associate Beadle Bamford and Sacha Baron Cohen is a rival barber, the flamboyant Signor Adolfo Pirelli.